Zeke Strong (born in 1923 at Isabella, OK) was one of the mainstays of the Los Angeles R & B scene in the 50s and 60s. Bandleader, saxophonist, writer, producer, label owner and occasional vocalist – he covered all the musical bases. He put out two 45s by Juanita Strong (wife? daughter?) in the early 60s on his own Progress concern and they should be rather better regarded and familiar to fans than they are now. 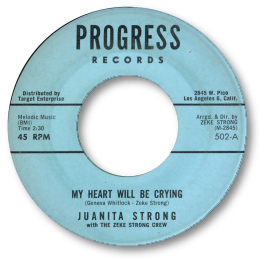 My Heart Will Be Crying is a strong stop-go blues ballad with a willing and flexible vocal from Juanita. Wonderful big band support from Zeke’s players – as a sax man himself he could be relied on to put a big fat horn chart together. Excellent guitar solo too. I’ve Seen You Somewhere Before is a similarly paced and styled number, benefiting from some good background harmonies. Zeke Strong passed away in May 2003 in Phoenix, AR. I shall keep highlighting wonderful West Coast soul blues until somebody who knows more about the artists and musicians comes along to help. Anybody? 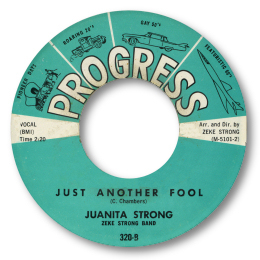 UPDATED ~ Andy Aitchison has provided details of another Juanita Strong 45. Now added to the discography. Thanks to Andy Aitchison for extra info.